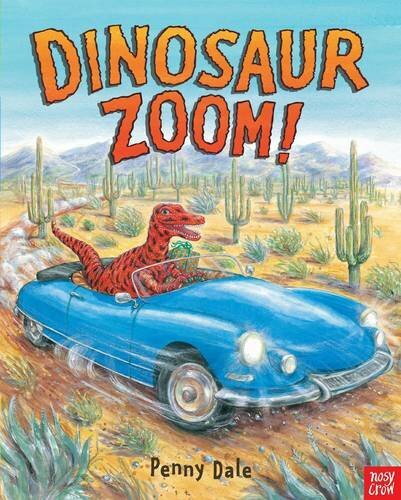 Penny Dale’s new books about dinosaurs driving vehicles are aimed so squarely at the toddler boy market it makes my teeth itch. In the first book Dinosaur Dig! the dinosaurs crunch and plough their way through the pages on different kinds of machinery, from tractors to excavators. In this, the second, the same dinosaurs are in cars, on motorbikes and in camper vans, zooming their way through the woods to a surprise party for the youngest dinosaur. The endpapers are filled with dinosaurs and vehicles listed by name. Penny Dale is the best-selling author and illustrator of more than twenty picture books, many of which are drawn so that the young children are gender-neutral. It’s easy to suggest a sort of tackiness in the pairing of boys’ favourites (dinosaurs and trucks), and personally I dislike pre-schoolers being gender stereotyped in this way. Reading should be about the limitless world of the imagination, not saying if you like dinosaurs then you are sure to like cars. It sits uneasily with me. And yet. And yet the book is so well done, to be practically faultless. The bright, detailed illustrations are attractive and interesting. The text bounds and clatters along with such tremendous energy that it would be churlish not to join in. There are opportunities to spend lots of time on the book counting, learning colours, and remembering the names of different dinosaurs and vehicles. The ending – a surprise birthday party in the woods complete with an enormous cake and lots of presents – is the stuff of any child’s dreams and a real delight. Suffice it to say, my own toddler boy loved the book immediately and has asked for repeat readings daily.